Feel even more glamorous in a luxury Jaguar XJ and BMW 520D. Add US$ 50. If you want to impress that special someone, this is the package for you! Make your stay even more comfortable and worry-free. For baby-sitting, running errands, sightseeing, shopping, or assisting the elderly, a full-time personal assistant can make all the difference. 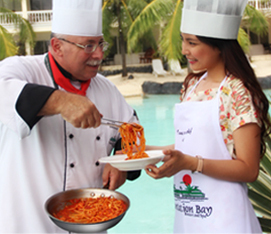 Learn how to cook a Plantation Bay specialty dish.